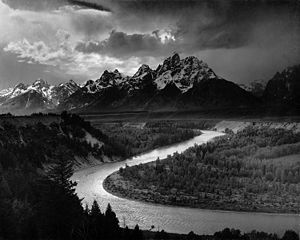 Ansel Easton Adams (February 20, 1902 – April 22, 1984) was an American photographer and conservationist remembered for his iconic black and white landscape photographs of the national parks and especially the American West. An author of numerous books about photography, Adams was an artistic and technical innovator, one of the outstanding technicians in the history of photography, and the inventor of the photographic method known as the zone system. A gifted concert pianist, Adams chose a career in photography after his encounter with the ground-breaking photographer Paul Strand. 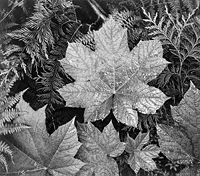 Adams worked for decades both to foster public awareness of photography as a fine art and to raise awareness of the grandeur and fragility of nature. In 1940 he helped organize the first public collection of photographs at the Museum of Modern Art, and in 1946 he established the first academic photography department at the California School of Fine Arts. Adams' business manager, William Turnage, said that "more than any other influential American of his epoch, Adams believed in both the possibility and the probability of humankind living in harmony and balance with its environment." Adams himself described a photograph as "an instrument of love and revelation." Ansel Adams was born and raised in San Francisco, California, the only child of Charles and Olive Adams. When he was four, he was thrown face-first into a garden wall in an aftershock from the 1906 San Francisco earthquake, breaking his nose. His nose was never repaired and appeared crooked for his entire life. He became interested in photography when his Aunt Mary gave him a copy of "In the Heart of the Sierras" while he was sick as a child. The photographs in the book by George Fiske piqued his interest enough to persuade his parents to vacation in Yosemite National Park in 1916, where he was given a camera as a gift. Adams disliked the uniformity of the education system and left school in 1915 to educate himself. He originally trained himself as a pianist, but Yosemite and the camera diverted his interest toward photography. Adams long alternated between a career as a concert pianist and one as a photographer. Adams became an committed environmentalist, and his photographs are a record of what many of these national parks were like before human intervention and development as parklands. His work has promoted many of the goals of the Sierra Club and brought environmental issues to light. Adams' work provided extensive documentation of America's wilderness and furthered efforts of environmental conservation. Adams shared with 19th century artists and philosophers the belief that an artistic vision must be embedded and find its relevance within the context of life on earth. Without a guiding vision, Adams held, photography is a trivial activity. He suggested that "the understanding of the inanimate and animate world of nature will aid in holding the world of man together." Adams met his future wife Virginia Rose Best in 1921, when he found a piano for practice at Best's Studio, a Yosemite concession selling paintings, photographs, books, and gifts. Virginia's father, Harry Best, was the owner. They were married on January 2, 1928, in Yosemite (her parents had also met and married in Yosemite in 1901). Ansel and Virginia had two children, Michael and Anne, five grandchildren, and four great-grandchildren. Adams' "zone system" is a technique that allows photographers to translate the light they see into specific densities on negatives and paper, thus giving them better control over finished photographs. Adams also pioneered the idea of visualization (which he often called 'previsualization,' though he later acknowledged that term to be a redundancy) of the finished print based upon the measured light values in the scene being photographed. His many books on photography include his trilogy of technical instruction manuals (The Camera, The Negative and The Print). 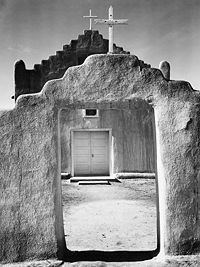 He co-founded the photographic association Group f/64 along with other masters like Edward Weston, Willard Van Dyke, and Imogen Cunningham. Photographs in Adams' limited edition book, Sierra Nevada: The John Muir Trail, along with his Congressional testimony, are credited with helping secure the designation of Sequoia and Kings Canyon as national parks in 1940. The same year he also helped organize the first public collection of photographs, at the Museum of Modern Art, and in 1946 he established the first academic photography department at the California School of Fine Arts. During World War Two, Adams worked on creating epic photographic murals for the United States Department of the Interior. 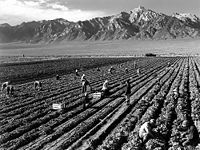 Distressed by the Japanese-American Internment that occurred after the Pearl Harbor attack, Adams got permission to visit the Manzanar War Relocation Center in the Owens Valley, at the foot of Mt. Williamson. The resulting photo-essay first appeared in a Museum of Modern Art exhibit, and later was published as Born Free and Equal: Photographs of the Loyal Japanese-Americans at Manzanar Relocation Center, Inyo County, California. In 1952 Adams was one of the founders of Aperture magazine and was the recipient of three Guggenheim fellowships during his career. In 1966 he was elected a fellow of the American Academy of Arts and Sciences. In 1980 Jimmy Carter awarded him the Presidential Medal of Freedom, the nation's highest civilian honor. The Minarets Wilderness in the Inyo National Forest was renamed the Ansel Adams Wilderness in 1984 in his honor. Mt. Ansel Adams, an 11,760-foot peak in the Sierra Nevada Mountains, was named for him in 1985. This page was last modified on 1 April 2016, at 21:49.